Place the soy sauce, mirin, golden syrup, garlic, ginger, ketchup, mustard and sherry vinegar in a bowl with 100ml of water and mix well. Pour the marinade into a freezer bag and add the beef, cherry tomatoes and button mushrooms. Seal the bag and allow to sit in the fridge for 30 minutes. 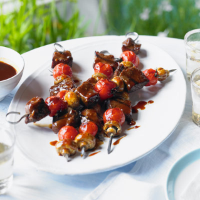 Build the skewers by piercing a cube of beef followed by a cherry tomato then a mushroom and so on. Place the skewers on the barbecue and cook the beef to your liking. In the meantime, pour the marinade into a saucepan, place the pan over a medium-high heat and boil to reduce by half. Once the skewers are cooked, brush them with some of the reduced marinade to glaze them before serving. The chargrilled notes of Heston’s Asian Kebabs are perfectly offset by this absolute gem of a wine. It’s a guaranteed crowd-pleaser. Waitrose Reserve Shiraz, St Hallett 2009 Barossa, Valley, S Australia.